Home / Get Instant Back Pain Relief with Ice Packs: How to use Ice Packs? Health	Progene HealthCare Daily Testosterone Complex Review: Are the claims true? Back pain is one of the most common yet dangerous health issues all over the world. According to the study, around 80% of the population will experience some sort of back pain at some point in their lives. The back pain could be either moderate or severe. Many people take back pain for granted, which they must not be doing. The most common cause of back pain is a torn or pulled muscle. The back pain could be very annoying at times. Back pain usually lasts from a few days to a few weeks. However, the duration of the back pain depends on the severity. In some cases of the back pain, it could last for months as well. There are many methods available for the treatment of back pain. In this article, we will take a deeper look at the ice pack for back pain relief. What are the types of ice packs for back pain? There are a variety of ice packs that can be to reduce pain, inflammation, and swelling. The choice of the people depends on personal preference, budget, and their condition. Here are the types of ice packs that can be used for reducing back pain. This type of ice pack is easily found at drug stores and general stores. This ice pack is usually filled with gel, and it can be made ready for use whenever needed. 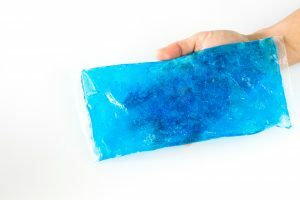 After the use of this ice pack, it can be frozen again. The ice packs can be easily prepared at your home as well without any difficulty. Here are some of the ways you can prepare ice packs at your home. Plastic bags and ice: To use ice for back pain, find a sealable plastic bag at first and put the required amount of ice in the bag. Do not forget to squeeze out all the air from the plastic bag before sealing it. The sealed plastic bag, they should be wrapped in the towel to prevent the skin from ice burn. A little bit of water can also be added in the plastic bag to ensure the bag is not so lumpy. A frozen towel: The towel can also be used as an ice pack. To make the towel as an ice pack, put the damp towel in the freezer at first. After 10-20 minutes, take out the frozen towel from the freezer. Sponge: Make the sponge wet, put the wet sponge in a plastic bag, and put it in the freezer. After some minutes, the sponge can be used for applying in the affected area. The ice massage for back pain can be effectively done with this ice pack. Rice: Fill a sock with rice and put the sock in the freezer to prepare an ice pack for back pain. The rice will be very cold after putting it in a freezer, but it does not melt like ice when it is applied to an affected area. Gel-type pack: Put the liquid dishwasher detergent in a sealed plastic bag and keep it in a freezer. The gel pack will be ready for you to apply after some time. Frozen pea bag: It’s a very easy job to prepare frozen pea bag for applying to an affected area. You simply have to find frozen peas along with other vegetables and wrap it in a towel. The final type of ice pack is an instant ice pack. These packs can be easily cracked, and the chemical reactions make these packs cold in a matter of seconds. It stays cold for an extended period of time, and this ice pack is great for those people who are very busy. How to apply ice for back pain? The study shows that applying the ice pack along with hot water treatment can significantly reduce the acute back pain. Now that you know about different types of ice packs, the question is how to ice massage for back pain. Here are simple steps to apply ice for back pain. Apply the ice pack gently and massage in a circular motion. Focus on applying the ice pack on the six-inch area of the back, the part which is affected. Do not apply the ice pack on the bony part of the spine. Do not apply the ice pack for a longer duration of time to prevent ice burn. Repeat the process several times in a day, according to a requirement. How long should you ice your back? The ice pack is a wonderful solution to get instant relief from back pain. However, one should know the proper way to apply the ice pack, and for how long should one apply the ice pack. The best time to apply the ice pack is in between 24-72 hours after your injury. Applying ice packs can quickly reduce pain, inflammation, and swelling. And, applying it can also reduce the tissue damage and numb the sore tissues. It’s not recommended to apply the ice pack for more than 20 minutes at a time. The ice pack can be applied for around 5-10 times in a span of 24 hours, depending on the condition. There are some precautions to be taken care of before applying an ice pack on the affected area. Here are some of the precautions to take with ice pack therapy. Make sure the ice pack is moved slowly in a circular motion, and do not keep the ice pack in one place for a long period of time. Do not make a mistake of falling asleep in the middle of ice therapy. If you are suffering from any kind of medical conditions, such as rheumatoid arthritis, cold, allergic conditions, paralysis, impaired sensation, and Raynaud’s syndrome, then you should stay away from applying ice packs. It’s not a compulsion to include the massage with the ice pack for getting the benefits from ice packs. Applying ice packs casually to the affected area can be enough to get quick relief from the lower back pain. All the information that is shared in the above sections of this article will help in applying different types of ice packs in a correct manner. The study shows that back pain is one of the most common reasons for absenteeism. So, it is important for people to know about various ways to get relief from back pain. Share this information with your loved ones as well because it’s important for each and every person to be aware of this information. Remember, Ice packs are one of the many methods of getting relief from back pain. The ice pack for back pain is effective; however, it’s better to know about other methods as well. There are many other ways to treat back pain. In case of severe back pain, it’s better to consult a doctor before it gets worse over time.